How was the career of Danny Trejo, the brutal ‘Machete,’ kick-started by a Soviet director? The scariest face in Hollywood got his lucky break when he bumped into film director Andrei Konchalovsky. As a rehabilitating drug addict just out of prison and on parole, Danny Trejo was struggling to make ends meet. His only craft, aside from dealing in drugs, was boxing: the would-be star had already claimed the lightweight and welterweight champion titles in San Quentin State Prison in California, where he had served his sentence. Released from prison, Trejo appealed for help from his old prison-mate who was now working for a Russian film director. “He asked me if I was still boxing. ‘We need somebody to train one of the actors’,” recalled Trejo many years after this life-changing conversation that paved the way to the top of Hollywood. Lacking formal experience, Trejo radically changed the course of his life when he happily agreed to train an actor for a short boxing scene in a film by a Russian director. Andrei Konchalovsky (left) and Denny Trejo (right). The man receiving boxing lessons from the would-be Machete was Eric Roberts, an actor who would later be nominated for an Academy Award for his role in the film. The film’s director was Andrei Konchalovsky, a Soviet director who went to the U.S. to “break the shackles that the Soviet authorities had put on him,” according to his recollection (in Russian). Since then, Trejo has starred in dozens of movies, including a lead role in Robert Rodriguez’s trash cinema masterpiece, Machete. He became one of the most recognizable faces in Hollywood, but never forgot the odd tie to Russia that proved his lucky break. He has been to Russia on many occasions, the most recent in October 2018 when he attended Russia’s Comin Con fest. 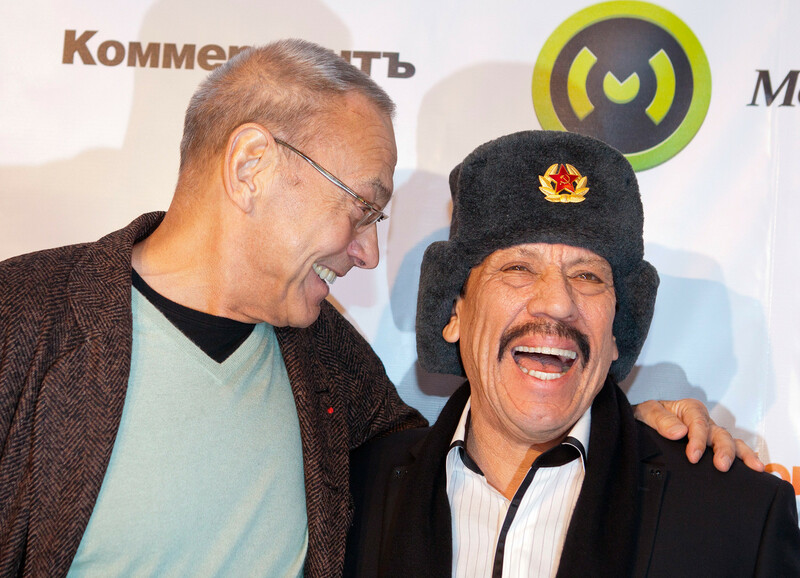 Before that, Trejo appeared twice on the popular Russian late-night show, Vecherny Urgant. Naturally, there must have been a snap on Red Square. As brutal as he looks in the photo, Trejo has rather warm feelings towards Russia, as well as to the man who first introduced the country to him. “I wasn’t in the [actors] union; I wasn’t an actor […] Andrei said ‘put him in the union,’ and that was it. My life changed,” said Trejo. Johnny Depp has also been to Russia and saw something special in the eyes of Slavic women. Surprised by Russia: What did Johnny Depp see in the eyes of Slavic women?